When you enter your favorite hotel, fast causal/fine dining restaurant, or lifestyle center, you’re looking for a comfortable atmosphere and a welcoming environment. We provide Mood to the best facilities throughout Upstate New York, serving their guests all day, every day, with just the right touch. Using the right combination of a sound system, video displays, and ScentAir, you can shape your client experience to fit your brand image. For many hotels we serve, our applications don’t stop in the lobbies; we provide full audio and video systems in the ballrooms, banquet centers, and meeting rooms. These installed or portable systems provide you the ease of use of your own equipment and liberate you from the hassles and expense of equipment rental. Your audio systems can be a value-added service you can upsell to your banquet and meeting clients as well! 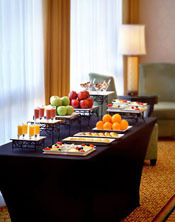 Give us a call, Contact Us to see how a few simple upgrades can enhance your hospitality experience. And visit our long list of Solutions and best in class Partners to see which ones fit your business.